Call Boat Owner George 228-522-6795 228-366-0408. Original owner, new ac and heat, 2 bilge pumps, new carpet, 5kw generator with only 30 hours on it, bronze props, brand new windlass, 15,000lbs capacity, 3 axle trailer,a must see. 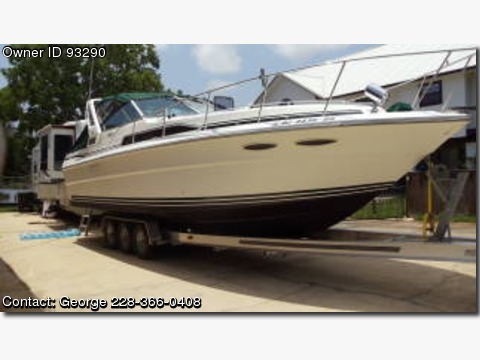 Located in Ocean Springs, MS Jackson County 1989 Sea Ray, 34 ft Express Cruiser, twin Hp: 340, Model 7.4 L.
Cabin is open and airey. New AC , Kohler Gen,35 hrs. 5.0,110 volt. New Widless anchor with chain & rope, new horn. Swim platform, with boarding ladder and transom ladder, Bow electric spot light. Complete canvas with eisenglass widows covers bridge and cockpit.